File photo from the National Christmas Tree lighting. 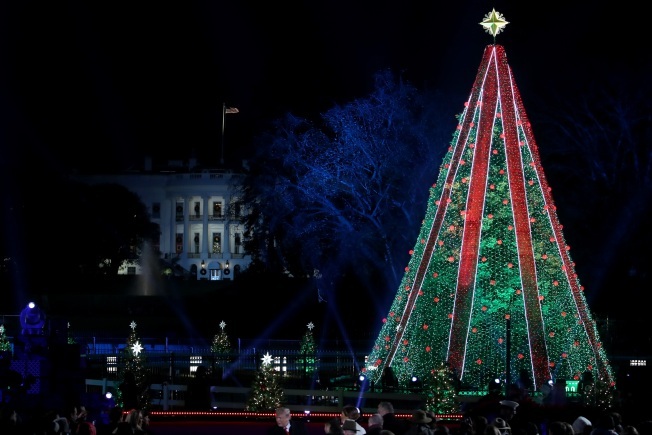 A man climbed 15-20 feet up the National Christmas Tree on the Ellipse just south of the White House Friday evening, U.S. Park Police confirmed. Police believe he was in some kind of emotional distress and negotiated with him to climb out of the tree. He was taken to a hospital for psychiatric evaluation. Some tree lights were damaged during the incident. People had lined up to get in to see the tree, but police closed the White House pageant area and will keep it closed the rest of the evening. The lights remained off Friday night. Saturday's holiday performance, which was the last one scheduled this season, is canceled. D.C. Fire and EMS assisted Park Police.